Coronary bypass surgery is a procedure that diverts the flow of blood around a the section of the heart that is partially blocked or entirely blocked. It creates a new pathway to the heart; the coronary bypass procedures improve the blood flow to the heart muscle. After a patient has coronary bypass surgery, the patient may have symptoms such as chest pain, shortness of breath due to poor blood flow within the heart, but this improves, for others, the heart function will improve, and there is reduced the risk of dying of heart disease. Why Is Coronary Bypass Surgery Done? After discussing treatment options with your doctor, he or she may recommend a coronary bypass surgery or other artery-opening procedures such as an angioplasty or stenting procedure. Severe chest pain caused by several arteries narrowing and the supply of blood going to the heart muscle. The heart muscles are not receiving enough blood even during light exercise or when the body is at rest. In particular cases stenting and angioplasty will help, but sometimes bypass coronary surgery may be the best option depending on the blocks. More than one diseased coronary artery, and the main pumping chamber of the heart – inside the left ventricle – it is not functioning well. The main coronary artery is extremely narrowed or blocked. This is the artery that supplies most of the blood to the left ventricle. Coronary bypass surgery can be performed in emergency scenarios when someone has just had and heart or if the doctor sees that a person is not responding to other treatments. After having a coronary by surgery, a person must change their lifestyle as part of treatment. Medications and drugs can be routine, after a coronary bypass surgery to lower the cholesterol levels in the blood, which will reduce the risk of developing blood clots and will help review stress off the heart and allow it to function better. Memory impairment and trouble thinking clearly. The patient’s risk of developing complications is low. However, it depends on the patient’s health before surgery. The doctor can give the patient a better idea of what the likelihood of experiencing these risk. The risk of complications is higher if the operation is done as an emergency procedure or if the patient has other medical conditions that may affect the outcome, such as emphysema, diabetes, blocked arteries in the legs or kidney diseases. Your doctor will give you specific instructions on what to do before you bypass surgery. He/She will give your activity restrictions, changes that need to be made to your diet or medications and what should follow before surgery. Your doctor will give you pre-surgical test, which will include X-rays, blood test and electrocardiogram as well as coronary angiograms. A coronary angiogram is a unique X-ray procedure that uses dye to visualize the arteries that pump blood to your heart. Most people are admitted to the hospital on the morning of the surgery. However, there are cases in which a coronary bypass is performed in emergency situations, such as heart attacks. You may need to make arrangements for the following weeks after you surgery, It can take for to sick weeks to recover to the point where you can work, drive or perform you daily chores and activities. A coronary bypass surgery takes anywhere between three to six hours, and will require general anesthesia. The number of bypasses required depends on so the location of blockages as well as their diversity in the heart muscle. Most Coronary bypass surgeries are implemented through a long incision in the chest while blood flow is diverted through a heart-lung machine, this is referred to as on an on-pump coronary bypass surgery. The surgeon will make an incision down the center of the chest, along the breastbone. The surgeon will then spread open the rib cage to expose the heart. After the chest is opened the heart is temporarily stopped and the heart-lung machine will take over to circulate the blood in the body. The surgeon will then take a portion of a healthy blood vessel, which is often taken from the inside of the chest wall ( the internal mammary artery) or the lower leg. The surgeon will attach the bottom end of the vessel and the top end of the vessel to the top and bottom of the blocked artery so that blood is flow is desired around the portion of the diseased artery. Off-pump -beating-heart surgery. In this procedure, the heart is still beating, and the doctor will use special equipment to stable is an the area of the heart that is being worked upon. Off-pump surgery can be challenging because the heart is still moving and is not recommended for every. Minimally Invasive Surgery- This produce the surgeon will create smaller incisions in the chest, and use robotics and video imaging that the surgeon will operate in the small area, The variations of minimally invasive energy may be called keyhole surgery or port-access surgery. After the general anaesthesia is given to the patient, a breathing tube is inserted through the mouth. This tube is attached to a ventilator which helps the person breathe during and after the surgery. Since coronary bypass surgery is a major procedure, the patient will need to spend at leat a day or two in intensive care unit (ICU) afterward. In ICU, the patients vital signs are continuously monitored as well as breathing, heart and blood pressure. The beating two will remain in the patient’s throat until he/she wakes and can breathe by his/herself. The patient should expect six to 12 weeks of recovery. A patient can resume exercising and resume sexual activity after four to six weeks, but should have doctor approval before doing so. After the surgery, the most people will feel better and remain symptom-free for an as long as 10to 15 yeas. 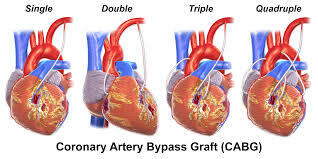 Over time, the arteries or even new graft used to bypass may become clogged, which would require another bypass or angioplasty. 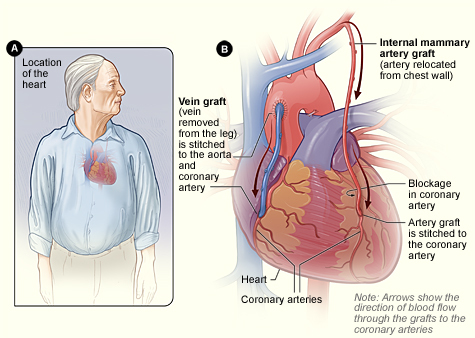 Bypass surgery does improve blood supply but does not cure coronary arteries disease. a patient will need to take medications and prevent blood clots, and lower blood pressure and cholesterol. Your doctor may also recommend cardiac rehabilitation program, with personalised exercise and education design to help you recover from the heart attack or another form of heart disease, after surgery. The cardiac rehabilitation will often begin while the patient is till in the hips tilt. Outpatient and Home-based maintenance programs can also be implemented to follow. ← What is an Upper Respiratory Tract Infection?